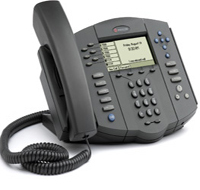 The SoundPoint IP330 phone is designed to be a cost effective, easy to navigate 2 line desk phone with dual switch Ethernet auto sensing PoE ports, allowing for flexible deployment options for savings on cabling expenses. Tested and certified to deliver comprehensive interoperability with leading SIP-based call control platforms, these phones have a standard base that can be reversed to become a wall mount, eliminating the need for additional hardware. Incorporating Polycom Acoustic Clarity Technology these phones will deliver superior call quality, enabling noise free and echo free conversations. 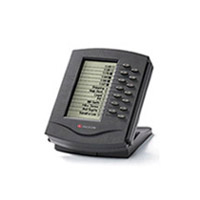 Rugged, durable and designed for both ease of use and attractive looks, Polycom sets a standard in IP-phones. Supporting three lines which allow you to see who is calling on which line, the SoundPoint 501 has been one of the most popular IP-Phones for years. Incorporating Polycom Acoustic Clarity Technology these phones will deliver superior noise free and echo free conversations. Supporting Cisco PoE with an optional cable, these phones are designed for easy installation, attractive appearance and functional use. You will find superb voice quality when used with a handset, a headset or in hands-free speaker phone mode. 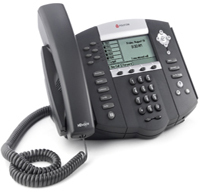 Bringing lifelike richness and superior quality on every call the Soundpoint IP 550 uses Polycom's new HD Voice. With styling that meets functionality this phone delivers advanced features and capabilities, such as shared call / bridged line appearance, busy lamp filed (BLF). presense, buddy lists, and text messaging. Add to all that integrated XHTML which will allow web based applications, and flexible customizable options and the SoundPoint 550 should be a phone which will handle just about any need. With six lines (standalone) and up to 12 lines (with expansion module), and advanced functionality including shared lines, busy lamp field (BLP), presence and XHTML applications, the IP 601 is an ideal phone for a receptionist. Capable of accepting up to three expansion modules, the IP 601 can scale up to accommodate most needs. 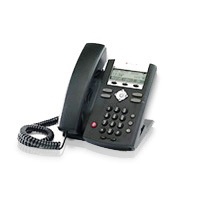 Durable and functional with an incorporated full duplex speakerphone and integrated 802.3af PoE support. With six lines (standalone) and up to 12 lines (with expansion module), and advanced functionality including shared lines, busy lamp field (BLP), presence and XHTML applications, the IP 650 is an ideal phone for a receptionist. 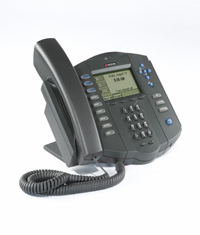 The SoundPoint IP 650 delivers all of its advanced capabilities through an intuitive user interface, with an incorporated full duplex speakerphone featuring a high-quality backlit LCD, an easy-to-navigate menu, and a combination of dedicated keys and soft keys for one-button access to essential features. Capable of accepting up to three expansion modules, the IP 601 can scale up to accommodate most needs. Durable and functional the IP 650 auto-senses PoE and has a built in USB port for future applications. With a graphical 160 x 320 pixel grayscale LCD and 14 illumined keys the attendant console can be configured as a line appearance or a speed dial with busy lamp filed (BLF). These attendant consoles are hot swappable and can be added or removed from any host phone at any time. Installation is easy as no extra cables or power supplies are requires. To see a complete attendant console [click here]. 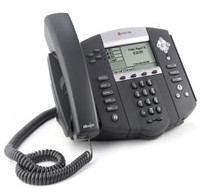 For a comparison of the Polycom IP Phones [click here].